Mera Peak Climbing in Nepal at Khumbu region has own values and significance in mountaineering. The highest trekking peak in Nepal located in Khumbu (Everest) Valley, Mera Peak (6,461m/21,190 ft) is one of the popular peak climbing destinations which not only entice trekkers for taking it up for excitement and thrill it offers but also for the splendid views of the mighty peaks from the top along with an experience of observing and traversing through the small but beautiful Sherpa villages and summer and winter pastoral settlements. Likewise a short flight to Lukla from Kathmandu takes you to the beginning of what is going to be a strenuous but an experience of a lifetime as Mera Peak Climbing. The expedition is one of the exciting and interesting ways of learning and experiencing the Himalayan lifestyle and culture. Although physically demanding because of the altitude, the climb on Mera Peak Climbing isn’t as difficult as it may seem. The extrovert sense of adventure and physical fitness is all you need to scale. It is designed carefully to allow the travelers accommodate with acclimatization. Bharal Adventure Pvt. Ltd. the as strong bond with the Everest climbed Sherpa of the Khumbu region. These climbers will make your Mera Peak mountaineering a walk on a park. Therefore, don’t hesitate and book with us for the ultimate peak climbing experience in Nepal. A quick breakfast will be followed by a guided tour to four of the most famous UNESCO World Heritage sites in Kathmandu that are Kathmandu Durbar Square, the sacred Hindu temple of Pashupatinath, the famous ‘Monkey Temple’ (Swayambhunath) and Buddhist shrine (Bouddhanath), which is also one of the largest stupas in the world. The equipments will be checked by the trek leader at noon followed by an interaction between the fellow participants and team leader at Bharal Adventure’s office. We will board the early morning flight to Lukla after a quick breakfast. 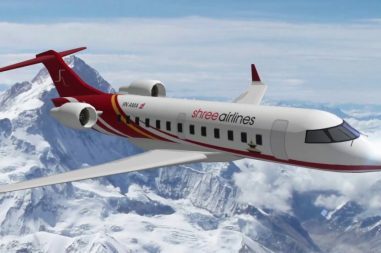 The breathtaking views of the Himalayas from the flight will make us realize how short forty minutes can be. As we reach one of the most beautiful air routes, Tenzing-Hillary Airport at Lukla, we will spend the day resting and acclimatizing for exploration of the nearby villages or the town will be done. This easy first day trek leads eastwards from where the path is less frequented unlike other main trails from Lulka. The walk follows through a number of hamlets and wood yards until we reach a thick forest of silver fir, birch, pines and rhododendron trees and bushes on the hill side below Nau Lekh, also known as Kalo Himal Ridge. This is a tricky path with many paths leading away from the main trail because of which we advice all the travelers to follow the Sherpa or the group. A summer pasture, Chutanga has many small streams with numerous places en route. The adventure begins as we trek through a steep climb to cross the Kalo Himal Ridge in the Nau Lekh range separating the Khumbu from the Hinku Valley. A steep uphill climb brings us to a cairned notch in the ridge with a collection of Buddhist prayer flags at 4,450m. This place is known as Zwatra-La Pass. From here, the path traverses across a boulder slope rounding a corner before it climbs back to the pass again at the height of 4,600m. Care should be given during the bad weather as the path could be misleading, however, during the good weather the views from here is simply awe-inspiring. After a quick breakfast, we descend following the trail across three ridges before going down steeply to the Hinku River from where we go uphill to Kothe through lush rhododendron forests on the west side of the Hinku Valley. Trekking along the ridge of the Hinku Khola in the shadow of Mera Peak, we stop at Gondishung, a summer herders’ settlement in the west bank of the Hinku Drangka, for lunch. As we across this settlement, we pass a 200 year old Lungsumba Gompa where a rock scripting on Mera Peak along with its route details could be found. From here, a short walk is required to reach Thaknak, a summer grazing area with ancient lodges and shops. Following the lateral moraine of Dig Glacier to Dig Kharka, we climb through moraines to the muzzle of the Hinku Nup and Shar gradually going up more steeply to Khare. The northern face of Mera Peak is visible from here. After lunch, exploration of the surroundings can be done. The guides will carry out the last minute checking of the gears for the climb and make arrangements for rental of any equipment if necessary. Training on peak climbing techniques will be given so as to boost the confidence of the summiteers and increase the chances of successful scaling of the summit. After breakfast, walk through a boulder-strewn steep trail will lead to Mera Peak Base Camp where we take a break for rest. Additional training could be provided if any of the climbers think they need more of it. Else, the remaining part of the day will be spent resting and preparing for the next day. The route through Mera-La Pass to reach the Mera High Camp is followed which is a rocky trail that could be hazardous because of the number of crevasses if it has had recent snowfall. The way to the top of the rock band marked by a large cairn is not easy but once we get there are set up a high camp, the views of Mt. Everest, Makalu, Cho-Oyu, south face of Lhotse, Nuptse, Chamlang and Baruntse makes the hard work worthwhile. For this big day, we need to wake up around two in the morning for breakfast and although it will be very cold in the beginning, we shall warm up as we continue climbing onto a peculiar ridge. The climb is rewarded with the first rays of sun hitting the mountains with awe-inspiring red glow. Still a non-technical route, we climb higher into it as the air begins to get thinner. The summit comes back into view as the sloop steepens behind the ridge and at the foot of the final steep summit cone, fixed rope might be needed to be attached with the climbers depending upon the situation. From here, the summit is only few meters away. The enchanting views of Mt. Everest (8,848m), Cho-Oyu (8,210m), Lhotse (8,516m), Makalu (8,463m), Kangchenjunga (8,586m), Nuptse (7,855m), Chamlang (7,319m), Baruntse (7 ,129m) and others could be seen from the summit. As we retrace our steep down to the high camp, we take rest for a while before we descend back to Khare. Since there is no guarantee of having a favorable weather on our day (12th) planned for the summit, we will set aside this day as contingency for such situation. However, if the trip goes smoothly, i.e., if we get to summit Mera Peak on the twelfth day, we will not be needing this as a spare day and could utilize it for walking back to Lukla at a relaxed pace. The same trail as before is used to trek from Khare to Kothe, upon reaching where, we will celebrate the success of the journey by indulging into the local delicacies and wines. An uphill trek through lush red and green rhododendron forests on the west side of the Hinku Valley, the trail to Thuli Kharka takes us through the company of magnificent mountains as the backdrop of the lush forests making us forest all the exhaustion of the journey. 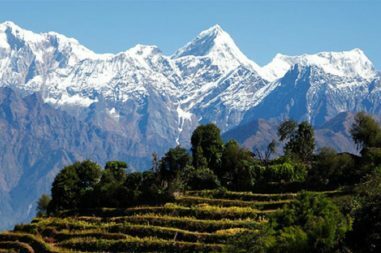 The remarkable views of Mera North, Mera Central and South face could be enjoyed upon arrival at Thuli Kharka. The day’s journey begins by ascending to Zwatra-La Pass from where the views of stunning Lukla Valley surrounded by Cho Oyu, Kongde Peak, Numbur Himal, Kusum Khangru and other Himalayan peaks could be enjoyed. Walking down to Chutanga going straight ahead to Lukla village, it might be late afternoon by the time we reach the village where we will enjoy the last dinner amidst the Himalayas.